First struck in 1986, the Gold American Eagle has quickly become one of the most popular gold coins in history, largely due to the intricate design of the coin which immortalizes Lady Liberty and the American Bald Eagle as symbols of independence and freedom. 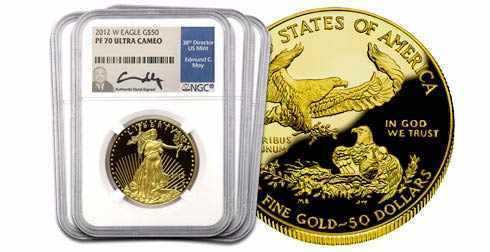 The inspiration for the Gold American Eagle came from the 1907 Augustus Saint-Gaudens’ Double Eagle, which is widely regarded as the most beautiful gold coin ever struck by the U.S. Mint. The obverse of the coin is Lady Liberty, assertively walking with an olive branch in her left hand as the symbol of peace and a torch in her right lighting the way to freedom. The reverse of the coin also includes an olive branch. A male eagle holds the olive branch in his talons as he returns to a nest with a female eagle and two eaglets. 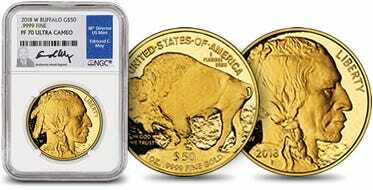 The $50 Gold American contains 1.091 Troy oz of 22-karat gold. 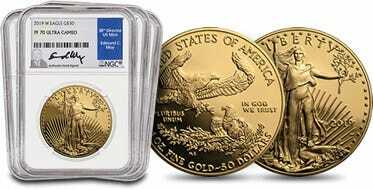 Production of Gold American Eagle coins are based on economic factors so production levels vary from year to year. Actual year will be based on availability at time of fulfillment.